Over fifty years ago, section 4 of the Voting Rights Act of 1964 sought to stop discrimination against voters through several new remedies, including facilitating access to those who do not speak English (remember that Puerto Ricans are US citizens, so they are entitled to vote, whether or not they speak English). Just five years ago, in 2011, New York governor Andrew Cuomo explicitly launched a language access policy for the entire state, since by then two and half million New Yorkers were not fluent in English. By the way, this topic of language access and your rights was covered in a long article in La Voz back in October 2015. Let’s return to the topic of providing voting access to each citizen in the language that they speak. In 2012, after a decree by the Department of Justice, Orange County was forced to comply with the law. For example, they now have Spanish language ballots and hire bilingual staff. The following year, after an agreement with the state attorney general, other counties, including Dutchess County, also complied and had their materials translated into Spanish. Although this story can be summarized in just a couple of paragraphs, it was not so quick or easy. Although necessary and required by law, many counties in our area did not prioritize the right to vote to all their residents. Many people had to raise their voices to make progress (such as Sonia Ayala, chair of the Latino Committee of the Democratic Party in Orange County). In Dutchess County, one person who advocated strongly for the right to vote in Spanish, was Democratic legislator Francena Amparo, from Wappingers Falls. Although the Latina Amparo does not speak Spanish, she realized the importance of complying with the law and sought ways to make it happen. Amparo has also worked for the health of her community and has no problem in proclaiming herself an openly gay Latina. Here is another story. In 1979 a young man who lived in Manhattan, and whose family originated in Puerto Rico, was placed at the Pius XII Residential Youth Program for Adolescents (also known as Holy Cross Campus) in Rhinecliff, New York. This experience turned his life towards a more positive direction, serving the community, especially young people. William Sanchez has been working with youth and families in education, residential settings, criminal and juvenile justice, youth development and youth leadership, and in community leadership and development for over 30 years. Representing the Republican Party, for the past 20 years Sánchez has also been a justice for the Village of Rhinebeck. He speaks both Spanish and English. Representing the Working Families Party (WFP), Sandra Cuellar Oxford also came from New York City to this area and has a long history of helping her community. But Oxford’s interests became focused on improving the conditions of the farm workers that she met in Ulster and Sullivan Counties (where she currently resides). Appalled by what she says was the economic inequity, systemic racism legislatively held-over from the Jim Crow era, Sandra developed a determination to become a strong ally to Farm Workers and the NYS Farm Worker Justice Campaign. One thing leads to another, and Oxford has also worked with unions to improve working conditions for the workers in the food processing industry in our area. Despite the different paths that each of them has traveled, these three Latinos working in local politics have more than one thing in common. Amparo, Sánchez and Oxford will sit together in a panel presented by La Voz magazine and the Center for Civic Engagement at Bard College on Wednesday, March 16th at 4:30 pm at RKC 103, Bard College, Annandale-on-Hudson, NY. 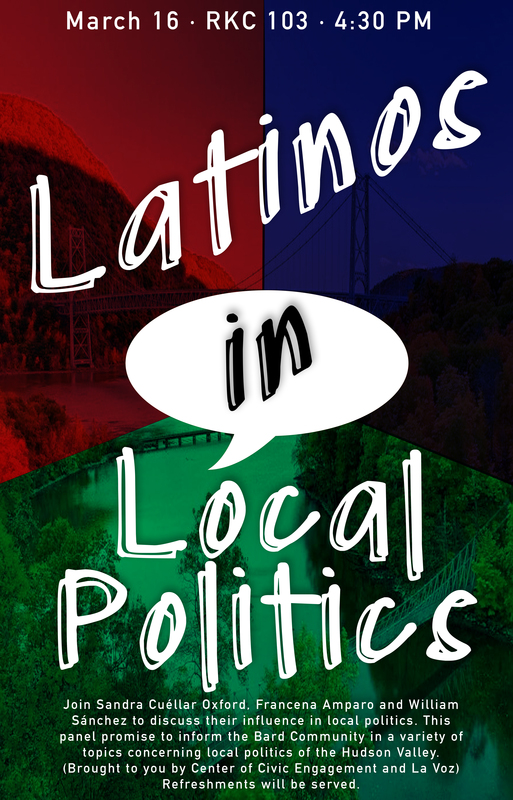 This panel Latinos in Local Politics (moderated by your truly), promises to answer many questions and educate us all about life and politics here in the Mid-Hudson Valley. Admission is free. See you there!